Center: A Navajo Indian hogan. 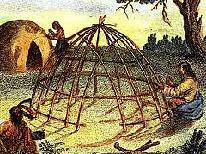 Right: A wigwam frame being woven together. In the background, a woman applies birch bark over insulation made of woven reed mats. Click here for a photo of an underground home, the type discussed below. This page can get long and unwieldy, for it calls in a lot of variables regarding conditions we can barely predict. In addition, it will touch upon issues most of us would rather not deal with, for the pole shift will not be pretty. As this page progresses, these conditions and issues will be spelled out, since they will affect our most basic assumptions regarding shelter construction. For starters, let's look at some basic construction facts we'll need to remember as we prepare for the cataclysms and life post-shift. From the book 'Weatherproofing', part of a Time-Life series that came out in 1977. In and of itself, this book is not worth picking up. However, it begins to set the table for material that will follow on this page. Damp timbers are susceptible to fungi. Water must be channeled off the house and away from the foundation. To help prevent rainwater from leaking into the basement, you can bank the earth around the foundation of the home. Water that collects around the foundation of a house can exert up to 500 pounds per square foot of pressure. You can dig ditches (swales) around the house to channel water away. These are bermed on the side closer to the house. No amount of interior patching will stop penetration caused by the power of substantial subsurface water pressure. The object of insulation is to block the flow of heat into or out of the house. Heat always flows from an area of higher temperature to an area of lower, just as water flows from a high point to a lower one. Wood, metal, and solid masonry are generally poor resisters of heat flow. A modern fiberglass blanket only 6 inches thick blocks the flow of heat as effectively as 8 feet of solid brick wall. In winter, periodically check your roof for ice dams. These can retain unwanted moisture, producing serious leaks. If you find any dams, break them up and remove them. Unless you’re accustomed to swinging a heavy pick, schedule your digging work in installments to avoid hand blisters and backaches. Through skillful placement, fences and walls can moderate the forces of wind and the flow of frost. A concrete foundation is not always necessary. Many light structures can be set directly in or on top of the soil. The post-and-beam method for constructing shelters allows the builder to use 4-to-8-inch-thick wood that can bear tremendous loads. The wood can be spaced at greater intervals and with somewhat less precision than is found in residential framing. Serpentine walls: Thomas Jefferson admired these on a tour of famous English gardens in the 1780s. In England they were called “crinkle-crankle”. Unlike traditional masonry walls, the serpentine design needed no buttressing pilasters (vertical supports) and no double layer of bricks. Instead, it derived its strength from the built-in curves. Plants thrived at the bases of these English walls because the curvature focused the sun’s warmth. Although a serpentine wall was longer than a straight one spanning the same distance, it required only about two-thirds the number of bricks. This type of wall consists of identical curves in a wavelike pattern. The trick now as then is to make the height of the wall consistent with the degree of curvature. As the British masons had discovered, the higher the wall, the more it had to undulate to maintain itself. A low wall could be built in a series of shallow curves. For a higher wall, the curves had to be tighter and to extend farther out from the wall’s center line. The radius of the curves should be less than twice the proposed height of the wall, and the total width of the wall should be more than half the wall’s proposed height. Thus a serpentine wall with a height of 4 feet above ground level would have to be built in curves that had a radius of 8 feet or less and a total width of at least 2 feet. In regions where high winds prevail, you may need even tighter curves. In 1949, workers at the University of Virginia attempted to rebuild Jefferson’s winding walls. They conjectured that the original bricklayers had not mixed enough crushed oyster shells - a source of lime - into the mortar. Comment on serpentine walls: Such walls can help protect a small community from wind, and they can also function as heat reflectors. Reflectors are commonly described in books about outdoor survival. This type of wall may also be more resistant to the earthquake aftershocks we can expect. 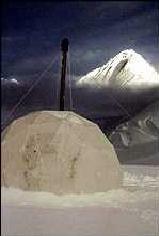 A geodesic dome can span up to 30 feet without internal bracing. (Though in other places I’ve read the span can be much wider.) A dome is easy to disassemble. It is relatively easy to build with wooden struts. Just be sure you have a good set of directions with precise measurements. An arch roof has a tendency to flatten out. To help prevent this, you can tie tension rods, forming diameters across the bottom part of the arch, one end to another. Heat loss is mainly upward. Gaps in insulation are created by the interplay between the house-warmed inside part of the roof and the winter-cooled outside. Rain doesn’t see a shelter as a fortress standing against the elements. It sees it as a box covering a hole into which the rain wants very much to pour. You have two lines of defense: The exterior skin of the shelter, and the foundation drains. Make sure the drains form a continuous, downward-sloping network leading to a hillside and that your excavation is not below the groundwater level. The key elements of construction are structure, waterproofing, and insulation. Everything else is secondary. A continuous unbroken sheet of plastic can form a vapor barrier on walls. You apply the plastic before finishing off the walls with other surfacing materials. From the book 'The Homestead Builder' by Charles Dwyer, first published in 1872. This book was written for homesteaders in the American west and midwest at the time. It was "dedicated to those who wish to make a home with whatever means nature may supply." No wood? Build with sod, adobe, or gravel, because earth, by compression, is capable of forming a ready and reliable material for building. Necessity is your superintending architect, and the immediate locality is alone to be looked to for the supply of material with which to build. The barn, too susceptible to fire, should never be connected to the house. To preserve them from rust, the steel and iron tools should be coated with oil when they’re put away. When digging a well, dangerous gasses may emerge. Before going down, stick a candle down there. If it gets extinguished, it’s too dangerous. A bushel or two of quicklime may neutralize the gasses. Raise the ground around the top of the well to help prevent dirty water from running in. Drainage is easy to provide for at the beginning of construction, but it’s so often neglected. There is no excuse for it being overlooked. Rats are apt to seek the heat of your home in winter. You don’t want rain or wind coming down your top vent. Thatching: Vermin often take refuge in it, and it can also catch on fire. Susceptible to wind damage. Needs frequent repair. A plaster mix can be made with 3 parts of washed sand, 2 parts of wood ashes, 1 part clay. Mix the mass and wet it sufficiently. If I read the author correctly, thickly plastered walls may help keep out vermin. Regarding pisé, or rammed-earth houses: The principle is that continuous layers -- or strata -- of hardened surfaces make a solid mass. Earth, by compression, is capable of forming a ready and reliable material for building. It’s common in France. The military engineers of America, no doubt borrowing the idea from the Romans of old, have long since built up earth forts that have proved vastly preferable as modes of defense to any constructed of stone. This is the best mode of using earth as a building material. You’ve reached clay soil when the dirt is forming lumps on the spade. Gravel mixed with clay makes for good working material. Three parts gravel and one part clay will make as good material for this purpose as need be had, as it contains the binding and strengthening requirements. Fatty clay or sandy soil are both to be avoided. If any stones are larger than a hen egg they are to be broken up and mixed in. If the material is too wet, it will not bear the ramming. If too dry it will not adhere together as required. Two to three inches should be the thickness of each layer to be tamped or rammed. The clay must be perfectly free from all vegetable matter such as roots and leaves, or else you may diminish the future stability of the wall. No more should be dug than can be used in a day. Cover the work from rain. The next layer shouldn’t begin until the first one is so hard as to almost ring under the blows of the rammer. Don’t plaster the inside walls for a few months. Let the air take the moisture out of the walls. The labor does not exceed that expended on making inferior dwellings. Walls of compressed earth are thoroughly dry in 40 days and can bear the weight of the roof immediately. The walls dry as well in cool weather as in warm, for air, not heat, is the critical factor. Although masons or bricklayers might be very useful in a small pioneer colony, they may be easier dispensed with than can a carpenter. There is great economy in taking care of tools. Keep them in a closet or box. To prevent rusting, smear them with grease on the steel or iron parts. Keep sharp edges on tools so as to have them ready for service in an emergency. This book gets more to the core of the issues we'll face in shelter construction post-shift. However, it doesn't quite nail them on the head. Good drainage of the soil will mean fewer moisture problems and also less potential damage from heaving frost. If you are building into a hill, there is also the possibility of exposing your back wall to ‘soil creep’ pressures. Pressure is caused by the hill slowly flattening out as the moist soil creeps downward. Often these soil pressures can be tremendous. Perhaps at one time or another you’ve seen a telephone pole angling away from a hill. This is one example of soil creep. The bottom of your footing should be at least three or four feet above the water table. So in a below-ground structure in winter, your heating system need only increase temperatures a relatively small amount, and you enjoy temperature stability. 2) Wind blowing past your home creates a zone of low pressure, with resulting higher pressure inside your home. This helps force your hot air out. 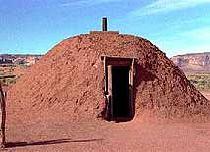 Adding an earthen roof has the effect of adding an additional wall to your house -- an additional side, so to speak. This increases the temperature-moderating effect and the wind protection. If you decide to put two feet of earth on the roof, you need to support about 200 pounds per square foot. Remember, soil can hold a lot of moisture. Allowing for snow, you might need to support 300 pounds per square foot. Most true underground houses use pre-stressed concrete planks for the roofs. These are lifted by cranes. Most experts feel that earth-exposed black plastic has a useful life of 15 years for effective underground waterproofing. However, the plastic can break from expansion and contraction of the soil, as well as from acids contained within it. Without wall insulation, there will be considerable heat loss into the damp soil. Though over time, the ground adjacent to the walls will warm up. It generally takes a large quantity of wood to support an earthen roof. Frost heaving, water pressure, or even the slight shifting of the soil will sooner or later exert enough force to break the mortared bonding between concrete blocks (if you use them for walls). If you build into a hill, you may get a temporary buildup of water pressure during heavy rains. To prevent water infiltration, you will need some kind of moisture-proofing system for your walls. Earth-packed walls are the most vulnerable areas of the house. Eggert describes his 10x15-foot office, dug halfway into the ground. The dirt that was dug was used to berm three of the sides. The concrete walls and floor are insulated on the outside, making the structure function as a large heat-storage container. On cold winter days there is no need for supplementary wood heat until long after dark. The earth-berm effectively blocks wind infiltration and delivers a constant earth-heat to the walls throughout the winter. The author has an ordinary shed roof with a slope of two inches to the foot. There are six inches of insulation in the ceiling, an air space above, and galvanized steel roofing on top. One inch of insulation lies under the floor to minimize heat loss and to prevent condensation during extra-humid days in summer. A roof extended two feet past the walls makes it difficult for even a hard-driven rain to dampen the earth near the top of the walls. On one side, a gutter takes roof runoff water and channels it a good distance away. People can walk up to this back wall and have the eaves-trough nearly at shoelace level, yet this is an integral part of most earth-sheltered structures that use a conventional roof. But during extremely wet weather you could have some water pressure problems. To defend against this, the author painted the outside and inside of his walls with two coats of a cement-based waterproofing paint. Two insulated vents near the ceiling help create cross-ventilation. Concrete continues to be the most basic of all the poor man’s building materials. A footing is normally as deep as a wall’s thickness and twice as wide. Heavier soils are more vulnerable to frost-heaving. Floor work generally comes last, after the roof has been completed. This allows time for the walls and footing to settle. The shed roof is probably the simplest type of roofing system for the inexperienced carpenter to build and maintain. It’s relatively safe to work on. Shingles are ghosts from the past. The cabin builder of times past, working with the material at hand, split pieces of wood and put them side by side on his roof. He staggered each succeeding row to cover the cracks in the row below. It was an improvement over pine boughs or grass. Galvanized steel is less expensive than petroleum-based asphalt roofing materials. It’s more durable and easier to install than shingles. It’s fireproof and it allows for easy snow removal. Most houses, especially in northern climates, need continuous air movement above the ceiling insulation to remove excessive moisture in the wintertime and also surplus heat, which if not allowed to escape could cause the common problem of ice-damming. You need retaining walls to contain your berming. Instead of concrete, you can use stone. You can also create terraces in the berming with stone. 4 or 5 feet of earth on the roof gives you the most amount of insulation for the least amount of weight. The earth will weigh about 100 pounds per cubic foot. 5 feet of earth will give you about 90% of the insulation value that 10 feet will give you. However, the strength of the roof slab needed to hold up 10 feet of earth would be unreasonable. The engineering problems are basically the same regardless of whether you have one side, two sides, or all four sides plus the roof covered by earth. However, the problems are substantially increased in direct proportion to the amount of exterior wall surface you cover. You'll need to be in good physical shape. For instance, a concrete block soaked by rain can weigh nearly 100 pounds. With only 4 feet of dirt and 10 inches of concrete for a roof, the lowest temperature the author recorded inside his home while under construction -- during the winter -- was 46° F. This was without man-made heat of any kind. Under long periods of heavy rain, ground that’s normally dry can turn into a big swamp. Try to construct on higher elevations to take advantage of water runoff. Into-the-hill construction is the most popular approach to building underground. This method is by far the easiest. If you expect a retaining wall to easily stand on its own, you're in for a rude surprise. Nature, by means of freezing and thawing the soil, not to mention the weight of the soil, is trying to push that retaining wall right over. For underground construction, the material for walls is best limited to two types: concrete or wood. The two possible ways of erecting concrete are pouring it in forms or laying concrete blocks. The author found that after five years living in his underground home, about 85% of the heat loss was through the ceiling. To assist with water runoff, maintain at least a 10° slope in the grading of the soil above the roof. Also, pack the soil as firmly as the roofing will support. Condensation: Remember, hot and cold separated by a thin membrane will cause moisture to form on the warmer side. That’s why car windows can fog up on the inside on cold days. Thicker walls, in this case earth-berming, create a thicker membrane, thus less condensation. Air pockets built into the walls help prevent “sponging” of moist air from the earth to the interior. An underground home takes only 25% of the heat required for a conventional home. A common structural constraint is the one that limits the span of ceiling sections between supporting walls or columns. For example, conventionally poured, reinforced-concrete roofs usually require a support every 10 to 20 feet. Design a house to fit the site rather than fitting the site to a pre-conceived style of house. You do not want to place an underground house at the base of a hill or in the bottom of a valley. It will be very difficult to prevent water intrusion and erosion problems. No matter what, arrange for drainage away from the structure both at the ground level and down at the footing level. What can you do with a flat lot? Simply put the house into the ground a few feet, and pile soil onto the roof and against three walls to create a pleasant little hill on a formerly flat site. A variation of this design is the earth-contact house, which has a fully exposed, conventional roof and earth berms usually on three walls. These berms extend either partially or completely up to the roof. If you build an underground house too deeply on a flat lot, it can float if the rains get bad enough. If you strike rock when digging the foundation, it’s not all bad, because the structure is less likely to settle. If you run into rock early while excavating a sloping site, it will probably get worse as you dig further. That’s because rock usually follows surface contours. There is usually a depth at which the soil is saturated with water. This depth is call the water table. If you dig a hole that penetrates the water table, water will come into the hole. Above-ground earth-contact homes may require a stronger wall structure, since there is no rigid tie between walls (most often provided by the reinforced concrete roof of an underground house). Good drainage is the basis for good waterproofing, and that starts with surface contouring. The path of running surface water should be toward a spot at least 10 feet beyond the boundaries of the underground house. Under no circumstances should standing water be allowed near the house. Standing water usually implies saturated earth, which means trouble. After surface contouring and perimeter drainage, the primary line of defense against water entry is the building material itself. Placing insulation outside the structure is often more effective than placing it inside. By including the roof and walls, it creates a larger thermal mass. However, low-mass construction (the kind we’re likely to build) does not benefit greatly from exterior insulation. By low-mass, the author means anything not built of concrete. In addition, considerable thermal-storage benefit can sometimes be obtained by placing rigid insulation in the earth a foot or so away from the exterior of lightweight walls such as wood or metal skins. But in practice, this isn’t always so easy to do. For heating, all you need is a small woodburning stove. You don’t need much wood -- a cord or less -- to make it through a typical cold season. If you choose too large a stove, you’ll be plagued with overheating problems and excessive smoke. Install a pipe to the outside for combustion air. If you’ve installed air ventilation in the manner described for root cellars, however, such a pipe may not be necessary. The smokestack can be screened to help prevent sparks from igniting sod on the roof. It might be a good idea to run the stack out the side of the structure, with piping leading a few feet away so as not to endanger it. Pay particular attention to the insulation around the pipe as it leaves the structure, for this is often a weak point in any insulation system. In warmer climates, avoid adding moisture to the air during the day. Combine this with whole-house ventilation at night, and you'll help keep the structure cooler. More to follow . . . .